00:00:00 - Patrick and Ryan obviously agree with Sarah Werning that paleontology is relevant. But can they convince Ben, and, by proxy, the world? 00:20:44 - Drinks are what happen when you realize maybe it wasn't that relevant after all. Patrick tries a Constalker Dark Wheat dropped off by Ryan, who in turn is having some overly sweet Choya-brand Umeshoo (i.e. Japanese plum wine). Ben approves, but himself is having some lemon Pelligrino. 00:26:54 - Matt Damon needs an exosuit to get to the Greek afterline so he can fight Jodie Foster in this week's installment of Trailer Trash Talk all about Neil Blomkamp's Elysium. 00:37:17 - Neutrinos are a thing, but barely. A detector in Antarctica has found a few that we're pretty sure are from outside the solar system. Ben explains, but will he beat the duck? 00:50:16 - PaleoPOWs are a lot like neutrinos, they come in several flavors and are hard to catch. The guys are awed when Ryan reveals a donation from John P. as well as an e-mail about all the good work he's doing helping the people of rural Ghana get better medical care, all while sporting a Science... sort of magnet on his laptop. Maybe more awesome than we can handle. Thanks, John! Ben reads an e-mail about the pronunciation of the letter 'z' from Guy D. but forgets why he's being informed in the first place (Hint: Episode - 171). Patrick presents a new addition to the Brachiolope Media Gallery courtesy of a drawing made by Anothy and posted to DeskSketch. Thanks, Anothy! 00:00:00 - According to Charlie, we're watching Saturn's moon Titan at a very special time in it's life. Specifically, it's runnin gout of methane, and all the other -anes to boot. How do we know? What does this mean? And will Ryan's plan to sell Titan survival matches work? Tune in to find out. 00:16:07 - Drinks, especially the kind we like to have on the show, are, like Titan, usually enriched in volatiles. Patrick procures a Peg Leg Imperial Stout from Heavy Seas. Charlie is sipping on the OG volatile, H2O. And Ryan has a disconcerted but not too shabby Rocky Mountain Oyster Stout from Wykoop Brewing Co. (with special thanks for Brew.by). 00:21:52 - Trailer Trash Talk gets a bit awkward as the guys discuss the happenings portrayed in the very dry, very indie, comedy Computer Chess. 00:32:37 - In our latest installment of "science testing common sense" turns out a nice walk in the park is good for you brain. The guys discuss their thoughts on the research, as well as how they handle the brain fatigue that accompanies the academic lifestyle. 00:51:14 - PaleoPOWs are a lot like brain fatigue, they show up usually once a day after lunch. We start things off with the end of the Flyer Content 2013! Charlie uses random.org to determine our three grand prize winners and our two runners up! Grand prize winners: Chris H., Dayna D., and Robert C. Congrats! You three win a t-shirt AND some science trading cards from Blue dot prints. Runners up: Shanna H. and Sam H. You both get some science trading cards! Thanks to everyone who participated in helping spread the word about the show. And a special thanks to Robert C. for creating a brand new flyer for us, available soon. Patrick reads a touching iTunes review from Irish Jazz, and Ryan wraps things up with a new recurring donation from Chris G. Thanks, Chris! If you're went to the website because of the Summer of Love 2013, leave us a comment letting us know it worked! And thanks for stopping by! Instead of talking about a trailer this week we're talking an ENTIRE MOVIE! Ben, Ryan, and new-to-the-podcast Jesse B. Grove V spend some time going over the ins and outs of the newest addition to the long line of Superman films: Man of Steel. Does Jor-El's robot have a name? Ryan says, "yes." 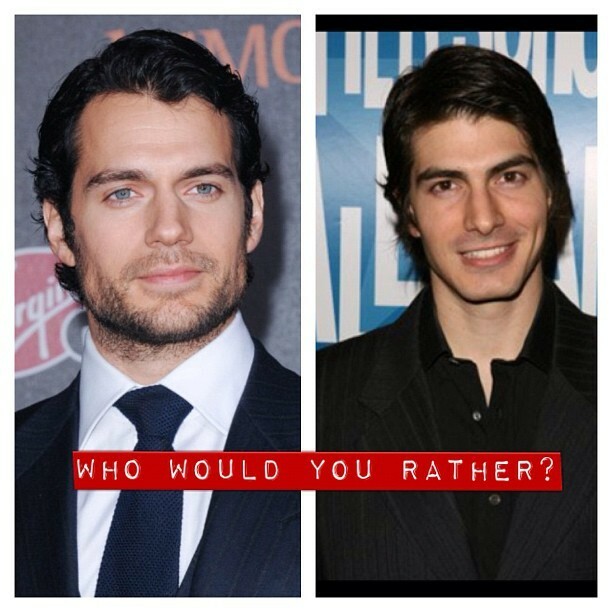 Which Superman actor has the best chin:Reeve,Routh, Cavill, Welling, or maybe even...Daly?. Is Superman boring? To this one, Ryan says, "no." Does the new movie support Ben'sUnified Theory of Superman's Powers? The jury remains out. Enjoy this cathartic episode of the podcast, and be sure to check out Jesse's webcomic, Eating the Bar, and all the other great shows on the Brachiolope Media Network!